She used census tracts to define neighborhoods because they tend to have economically homogeneous populations. Poor neighborhoods, Dr. Lee found, had nearly twice as many fast food restaurants and convenience stores as wealthier ones, and they had more than three times as many corner stores per square mile. But they also had nearly twice as many supermarkets and large-scale grocers per square mile. Her study, financed by the institute, was published in the March issue of Social Science and Medicine. Dr. Sturm’s study, published in February in The American Journal of Preventive Medicine…found no relationship between what type of food students said they ate, what they weighed, and the type of food within a mile and a half of their homes. He has also completed a national study of middle school students, with the same result — no consistent relationship between what the students ate and the type of food nearby. 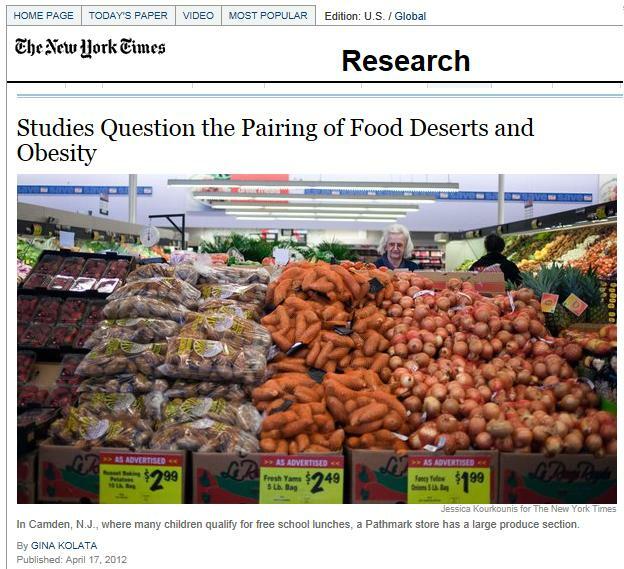 Living close to supermarkets or grocers did not make students thin and living close to fast food outlets did not make them fat.